For the retailer, life was dominated by the economic downturn and so everything was ad hoc. The Ad Hoc Retailer was a large enterprise with major data centers and a large IT staff, including maybe 1000 developers. However, it had a chequered history in recent years with mergers and new investors but an overall drop in market share, revenues and profit. The net result was that its share value had halved in the previous year and staff morale was low. Every decision was taken in the light of potential job losses and the need to be frugal. Headroom that had been established in the past was now effectively taken up so that capacity was becoming a major issue. The enterprise had an SDLC culture with PICs (Project Initiation Charters) for any task requiring more than one days individual effort. However, there was little infrastructure leeway left, and there was little infrastructure management left in place. Previous processes had been dropped as staff had gone and more project work was being done by fewer people with more services on more servers. There were ideas about a Service Catalogue and Service Level Agreements but they were emergent. There were many domains and also a history from different data centers so that there was a large number of what felt like separate kingdoms with barriers and lack of communication. Some of the project meetings were the first time that capacity management people in different teams had met. 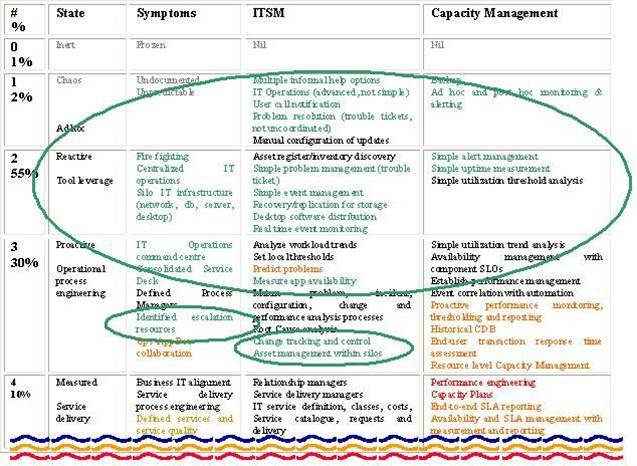 The first few columns show the CMMI maturity levels and an indication of the population of sites that are in each; the state it reflects (active/reactive) and some ITSM symptoms that indicate the level attributes. 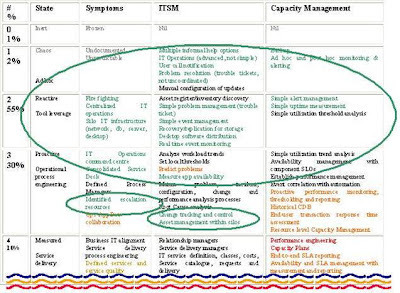 Then there is a column for the corresponding ITSM activities and the capacity management activities typical of each level. The cells for each intersection show relevant features, with traffic-light colors used to indicate where there are risks and dangers associated with the current level of maturity. The traffic-light is extended throughout the reports to allow for five colors. Grey or black is used to indicate comments that are not significant at this site. Red is clearly used for major issues. Orange is used for issues that are of concern. Off-yellow is used for areas where things are “on the edge” of becoming an issue. The circles indicate where this particular site mostly lies.